This is just going to be a very quick review of this novel, I read it about a month ago, so I don't remember too much about it!! One thing I do remember however is how much I enjoyed this novel, it was entertaining and very funny, there were some laugh out loud moments! One of the quotes on the cover likened this novel to Harry Potter, and although I'm normally sceptical of these kind of comparisons, I have to admit that this quote is bang on. The narrator and main character reads like a slightly more grown up Harry. He's as sarcastic and grounded as Harry, and the novel features magic which is a happy coincidence!! Quite a few reviews on Goodreads said that this novel has been written for TV, and I can see where these reviewers are coming from, it has the perfect mix of British crime drama with comedy, and a bit of magic mixed in! However I disagree that this novel has been written solely for tv, I think it stands securely as a novel in its own right. I do however, wholeheartedly support any petition/push to get this novel made into a tv series!! 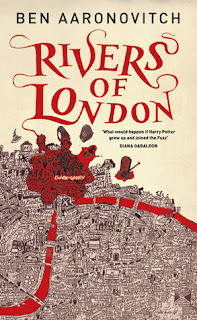 I don't know London very well, so location wise I wasn't always sure where the characters were, but I enjoyed the London setting, and I particularly enjoyed the British/London slang that the author had included. I will admit that I didn't get all of it, I guessed some, but it added to the setting of the novel, and to the appeal of the characters! I also appreciated the diverse range of characters in this novel, depicting the diverse nature of Britain through the ages very well, and with some particularly strong women which I always appreciate!! Overall I really enjoyed this novel, it was very funny, with the right amount of wit and sarcasm for me! I definitely recommend this novel, and I'm looking forward to picking up the next book soon!! !